Organic farming standards across Europe could be tightened up with a greater emphasis on animal welfare when the European Parliament’s Agriculture Committee meets on 13 October to discuss proposed amendments to existing regulations. This proposal in Europe to require stunning of all organic animals is similar to a proposal that came up in 2010 in the USDA National Organic Standards Board (NOSB), which is a 15-member public advisory committee to the USDA. 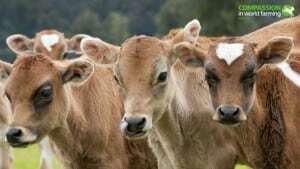 The problem came up because the Board members responsible for this proposal simply lacked information about stunning of animals being contrary to kosher and halal rules. Kosher and halal organizations in the US were able to weigh in, educate the Board members and thus prevent this idea from going any further. Therefore, in 2011, when the Organic Standards Board made a recommendation to the USDA to make comprehensive changes in the organic animal welfare standards, as one part of that recommendation stunning was not required for kosher and halal but there was a requirement that organic animals be kept upright for slaughter rather than hoisted. Where does this matter stand today? Following the action of the Organic Standards Board in 2011, the next step was for the USDA to issue a proposed regulation, publish it in the Federal Register and open it up for a period of public comment. So far, after 4 years, this has not yet happened, although the USDA has been saying recently it is making progress on the overall animal welfare proposal. My guess is that we will see it within the next 6 months to a year. As the organic movement in Europe and the EU takes up this issue, there is a much different history in Europe than in the U.S. In Europe there have been concerted efforts to require stunning of kosher and halal animals in general, as an issue of animal welfare. Thankfully we have not had that level of political activity in the U.S., and our Humane Methods of Slaughter Act, enacted in 1958, has exempted religious slaughter from its requirements. Still, I hope that the kosher and halal organizations in Europe, like the ones here in the US, can mobilize to keep the EU from requiring stunning of all organic animals. As you suggest, a requirement for stunning organic animals that does not exempt religious slaughter of organic animals will eliminate the possibility that any kosher and halal meat in Europe can be marketed as organic, even if all the other organic requirements for the meat have been met.